Sorry for the lack of update. We recently bought a new house and moved in almost 2 months ago but since it was an old house we had to update the interior decoration. The renovation process has been carried out by just the two of us (me and my husband) and currently we are renovating my own dream kitchen. I will start developing new products as soon as the kitchen is ready as I would need the oven to cure all of Littlest Sweet Shop treats. Here are some new parfaits in 7 new flavours! That's right - SEVEN variants. Each one with a different layer and topping. These were created a few weeks before we had to move out so I'm glad to finally début them here. 1/3 scale parfaits are available in the 1/3 Scale menu and it is a great size to be made into cute key-chains! Each parfait comes with a layer of custard pudding/chocolate pudding/strawberry pudding. A layer of dry topping is sandwiched between the first two layers for an extra yummy crunch! Some are layered with fresh fruits. All parfaits are topped with a swirl of vanilla soft-serve ice cream. Our parfaits have plenty of quality ingredients on each layer that every 1/3 or 1/4 scale doll can enjoy. 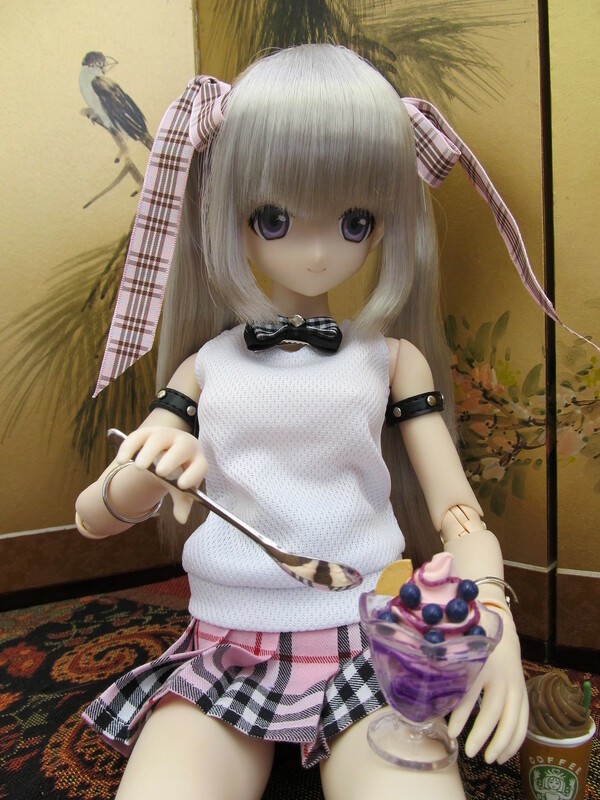 Below is a photo of a 1/3 scale Azone doll tucking into a strawberry and blueberry parfait. All our parfaits are decorated with the tastiest fruits and toppings! Each parfait will give a refreshing and different combination of flavours.The weather is starting to heat up so plan your order now! It was fun creating these parfaits since they are more enticing with the extra textures in each layer of yummyness. Any doll with a serious sweet-tooth won't be able to resist them! That's all for now. Come back next week to check out more new arrivals in the 1/6 scale menu.